Children's Colourful Jay Zip Wheelchair Cushion. Designed for children, the JAY Zip features comfortable skin protection and positioning. 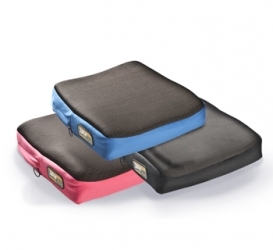 Convenient and colourful, this wheelchair cushion has a dual-layered foam base combining both comfort, and more importantly, structural support. The cushion's cover can be purchased in several colours, but, intriguingly has a unique property - it's fabric is impregnated with silver! This is because studies have shown that silver actually limits microbe growth. The cushion is made from the same material (X-static fabric) that's used in bandages and footwear. To sum up; the JAY Zip is a specially designed positioning cushion for kids that is comfortable, fun, supportive and with a clinically effective protective cover. Please note that a black cover comes as standard with the cushion.